Well our final tally for chicks is fifteen. They're healthy and unspeakably adorable. 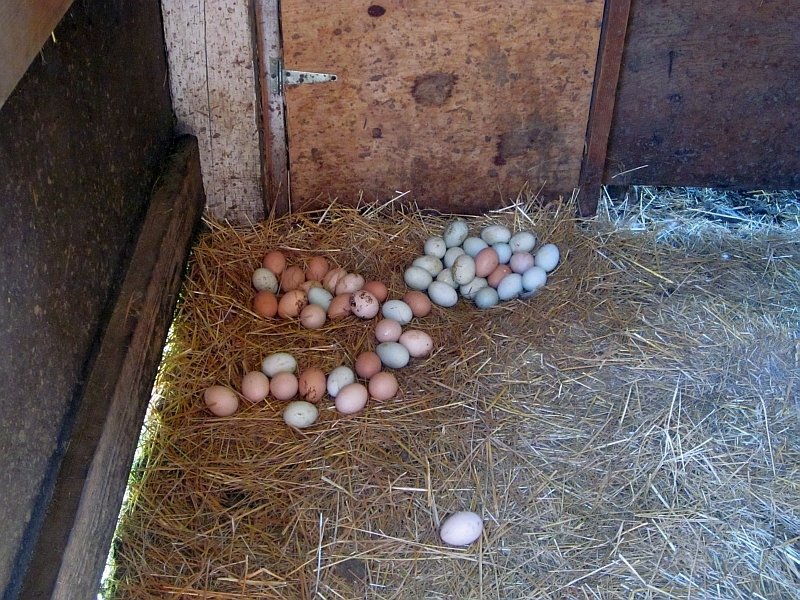 While some may argue that 15 out of 42 eggs is not a good return, I don't think it's half-bad considering the eggs were heaven-knows how old and just piled up in the barn for weeks before I found them. In other words, out of this batch of eggs which might otherwise have been thrown out in the compost pile, we have fifteen new healthy chicks. Not too shabby! By the way, if anyone wonders what an egg tooth (used by the baby chick to break out of the shell) looks like, it's the whitish knob at the tip of the chick's beak. It will be absorbed within a couple of weeks. 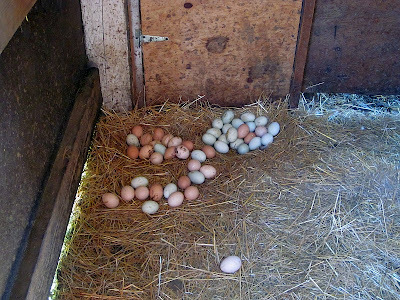 Meanwhile we had 27 unhatched eggs still in the incubator, ready to be tossed. Just to be on the safe side, though, we thought we'd let them sit for another day or two. As of this morning he still hasn't hatched out, so we're being patient. It's not healthy to "help" a chick out of its shell, because doing so often kills it. But if this little guy hasn't made any progress by this evening, we may do so anyway. If he can't push himself out of the shell, he'll die. But if we help him out, there's a chance he'll live. We'll see what happens. Meanwhile, we're standing by to incubate another batch. Odds are about half the new flock are roosters (which will grace our dinner table in a few months), plus we have some neighbors who want chicks, so we'll incubate one, maybe two more batches before the summer is through. Love the new babies! Gave up trying with my Ethel and Lucy - they only make roosters! Even though they all turned out to be beautiful birds, It broke my heart to give them away. I kept one, Charlie, and he is a real sweetheart! I just bought some pullets and they are almost big enough to merge in with the rest. Soon the fun begins! Birth is such a MIRACLE ! Doesn't matter if it is a human or a chick - the adaptations necessary to bring that process about is beautiful ! I, however , was equally impressed with your one line - "plus we have neighbors who want chicks " - such a wonderful witness of love that was given to us, - in addition to the DNA blueprint - from a God we revere ! My grandfather raised chickens. My father would still know how to raise them if he had to. I unfortunately don't. Dad wasn't interested in passing it on to me and we lived too far from Grandpa for him to teach me. Dad said Thanksgiving was a big deal because the family got to have turkey instead of boiled or stewed chicken. Grandpa raised his hens until they could no longer produce eggs and then butchered them. Whenever I make the rural move, should be in the next two years, I'd like to try my hand at raising chickens. We'll see how much Dad wants to teach me. We're raising chicks for the first time this summer, though we mail-ordered ours as day-olds from a hatchery. They are 6 weeks old now (26 of the original 29 have survived thus far) and they are a riot! Sometimes they're just malpositioned in the shell and can't get out. I get it started but quit if a lot of blood shows up. Don't want 'em to lose too much blood if the inner lining hasn't dried yet. If it has dried, they're hard to get out! Some of the delayed hatch chicks have something wrong with them and will die shortly, but I believe in giving everybody a chance. We never hatched our own chicks. We always ordered the through the mail and picked them up at the post office. Congratulations on the new arrivals! They are seriously too cute!! I have always wanted to incubate eggs. As soon as I get a big enough yard, I am so going to do it! My 3 year old and I are thoroughly enjoying keeping up with your hatching posts. We have some chickens, but can't have a rooster so we wont get to experience the excitement of incubating and hatching at our house. Thanks for letting us see what's going on at your house! Peep peep! Thanks for sharing Patrice. My "optimistic" 35 was way off the mark but I love your attitude of gratefulness towards your precious "15" considering they were possibly questionable eggs anyway. Please keep us up to date with photos of their progress. I look forward to your blog every day. God bless as you continue to share your journey with your readers. I'd say your experiment was a great success. My mother taught Kindergarten and First Grade for many years. Hatching chicks was something she did every year. I think she loved it more than the kids. She used to talk to them ("Peep, peep?") and was always so excited when they pecked their shells. Thank you for this trip down "memory lane." I've hatched a lot of chicks. Sometimes we have helped them and they are ok, especially if you know the temp and humidity are perfect for 21 days. I noticed that if the egg rolls around too much while they are hatching (other eggs/ chicks bump them), they get turned around inside. One time we helped in that situation and the head was tucked under the wing and the chick couldn't move her head.I think it was viable. Past 24 hours from first pip without a hatch is dire. So, to prevent them from rolling when other chicks hatch, we put down lengths of wood, 2x2s, or rulers, so they don't roll as much. It's also not good if they roll onto the pipped hole because then they can't get air in or out while they are scoring the inside.